Pathankot is a municipal corporation in Punjab state, India. It serves as the capital of the Pathankot district. 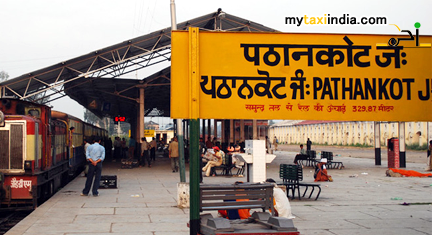 The name ‘Pathankot’ has been derived from Pathania Rajput, the king of Nurpur. Pathankot is a beautiful city in Punjab. It holds great tour potential and attracts many thousands of tourists each year. Mukteshwar Temple is one of the major tourist attractions of this place. It is situated on the bank of Ravi river. Some of the caves here date back to the era of the Mahabharata. The legends have it that Pandavas stayed in those caves for a night during their "Agayatwas". This temple is also referred to as Mukesran mandir. A carnival known as the Mukesran da mela is held here annually in the month of April to commemorate the arrival of Baisakhi. Kathgarh Temple is situated 7 kms. from Indora right on the meeting point of river Beas and Choch. The old temple is constructed in Mughal style and houses a 6 feet long and 5 feet round 'Shivalinga'. The 'Linga' is of its own kind. It is said that the kind of Linga cannot be found anywhere in the world. Another interesting fact about this Linga is that it is made from wood. It automatically breaks into two pieces and then the pieces are put in the right place. Thereafter, it retains its original state. Other important sites worth visiting in Pathankot include Nagni Temple, Nurpur Fort, Malikpur, Madhopur, and Ranjit Sagar Dam (Shahpur Kandi). Hiring a taxi in Pathankot will help you enjoy the tour in Punjab and areas around better. Looking forward to a tour to Pathankot? If yes, then you would definitely require an efficient taxi hire service to ensure comfortable and smooth travel. Visit us online or drop in personally at our branch office to book a car hire and railway transfer service that is class apart. At My Taxi India, we believe in ensuring proficiency and comfort to our esteemed clientele and potential customers. We are backed by a team of professionals dedicated to offer you complete support at all levels. For all queries, concerns, and booking requirements related to Pathankot tour, reach us at anytime. Our team is available 24 x 7 for your support. My Taxi India is dedicated to surpass all expectations of clients and making them feel at ease throughout the trip. With us, it is all about enjoying the safest and most comfortable journey ever! We undertake extreme pride in endorsing our unparalleled car hire and railway transfer services at competitive rates. Book a taxi with MY Taxi India and experience the difference.